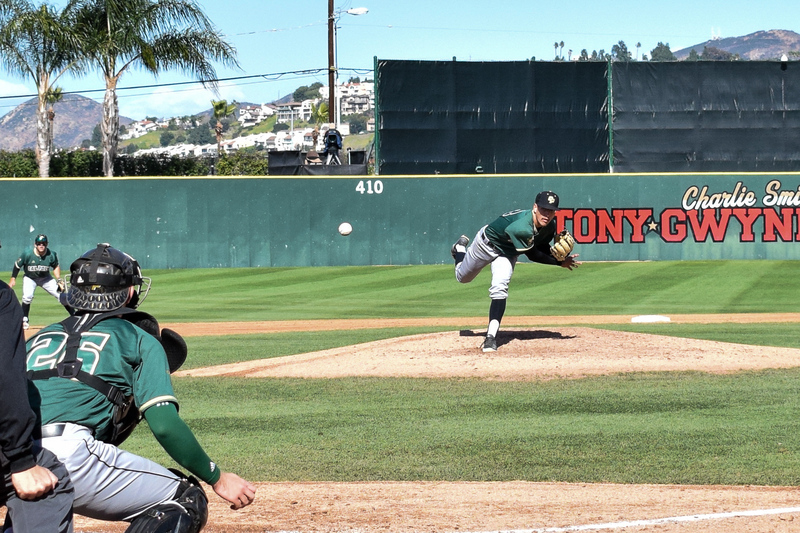 Cal Poly baseball started off with a bang in the Tony Gwynn Legacy tournament in San Diego by defeating No. 4-ranked Arkansas 4-3 on Friday. Cal Poly’s win over a top-five team was their first since the 2009 season when the Mustangs swept a doubleheader against No. 3 Rice 10-3 and 7-6. The Mustangs finished the tournament with two wins and one loss, bringing their overall record to 3-4. Junior center fielder Alex McKenna’s two-out single in the ninth inning knocked in freshman pinch-hitter Blake Wagensellar for the go-ahead run. Freshman left-hander Andrew Alvarez retired the Razorbacks in order in the bottom of the ninth to secure the come-from-behind win. In the first meeting between the two schools, the Mustangs were ahead 1-0 and 3-0 before McKenna hit the game-winning RBI. The loss went to Razorback junior Jake Reindl, as he allowed the run in the ninth and went two innings with one run, two hits, a walk and a strikeout. Cal Poly was held to just three hits as they fell to the Antelopes 5-1 Saturday. Junior Nick Meyer’s safety squeeze bunt gave Cal Poly a 1-0 lead in the second inning, but Grand Canyon collected twelve hits on four Cal Poly pitchers to defeat the Mustangs. Cal Poly’s senior left-hander Trent Shelton suffered the loss, giving up three runs and eight hits in six innings on the mound. Senior pitcher Mike Lundin earned the victory for Grand Canyon, allowing a run and two hits over six innings with three walks and two strikeouts. Led by sophomore catcher Myles Emmerson’s 4-4 day at the plate, Cal Poly defeated Michigan 8-1 in the final game of the weekend series. Emmerson drove in four runs with a triple and three singles. Freshman right-hander Darren Nelson tossed seven scoreless innings in his first win as a Mustang. In the first inning, Meyer, senior outfielder Josh George and freshman outfielder Cole Cabrera all hit run-scoring singles leading up to a two-run triple by Emmerson to give Cal Poly a 5-0 lead. Michigan’s only run in the game came in the eighth with junior Ako Thomas’ RBI single. The loss went to sophomore right-hander Karl Kauffmann as he gave up seven runs and nine hits over four-plus innings with two walks and four strikeouts. Cal Poly plays its final game in its season-opening eight-game road trip Feb. 27 at San Jose State.